Bug? Working as intended by misleading message? This appears to affect users across multiple platforms, and has been seen in regular posting, editing posts, and PM's. A workaround is clearing recent cookies and signing back in if you run into this issue. NOTE: This will only reset the counter, and you will need to eventually clear cookies/sign back in again. 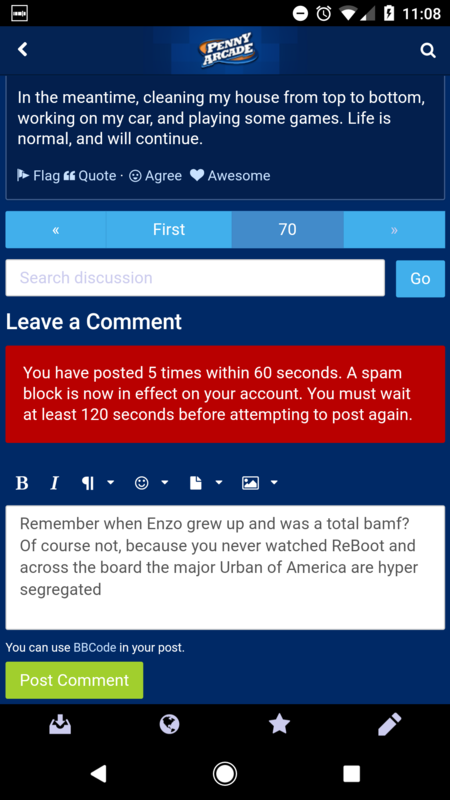 @Henroid is but can't respond here because it's getting spam blocked. Right now it's 2 chrome users, mobile or desktop doesn't seem to matter. I got this once an hour or so ago, I had posted a few times recently, but not within the spam block limits. I just saw the same error, using Mozilla Firefox on my home computer. Let's see if this let's me post now. just had it happen in SE, Chrome on a macbook. Happening to me as well. I've only made two posts in 5 minutes, but it's saying I've made 5 posts in 60 seconds. attempting to use IE to see if it fixes the problem. Was blocked out of posting on Firefox, Chrome and Safari. Trying to post via safari on my phone again...? It just let me post from my phone and on my computer again. Perhaps this was a blip? I don't think it's related to the setting itself. 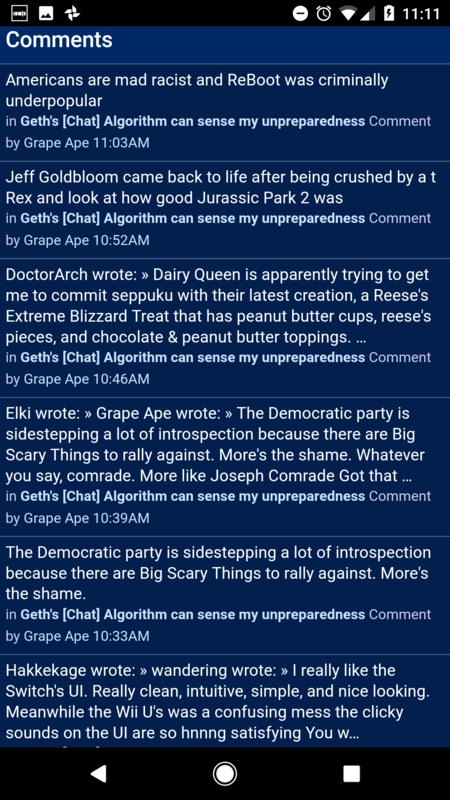 I was able to get a warning after 2 posted messages in PM and the warning message reflected this. Hit it on firefox at work on a desktop. Edit: Cleared up by swapping to Chrome. Yeah this is a Vanilla problem, I don't think browser will make a difference and we'll all just end up picking out patterns from random variance. Clearing my cache and cookies seems to have cleared it. May have been a coincidence though. Yeah that's what I found, looks like it skips admins entirely, though there's a lot of code to comb through to find what's causing it. Vanilla duders are good they'll find it. Who's still caught up? I'm not seeing anyone in the queue anymore. I was caught up in this but can now post again it seems! 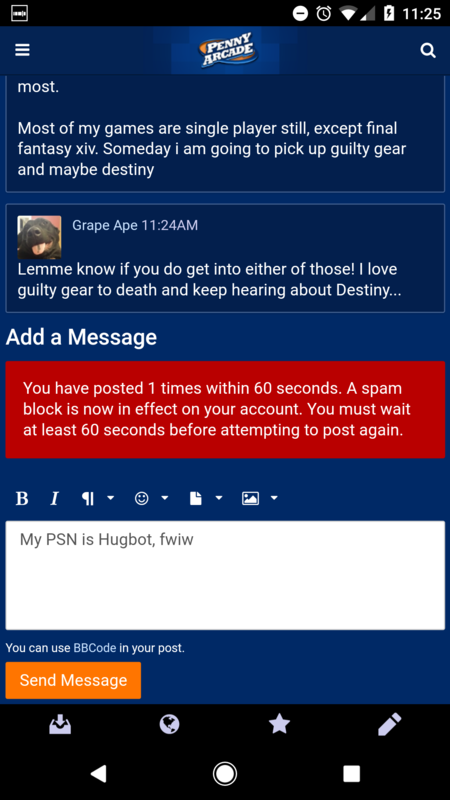 so the spam block is sending you a warning and then you can still post? I just got this when trying to send a PM (though eventually got it to send). I don't know if that's important. Let me see if I can trigger this. I experienced this but am now seemingly able to post normally. On Chrome incognito mode, if it matters. No. It blocks as stated.